Holiday cheer came early this year for patients in children’s hospitals around the country. 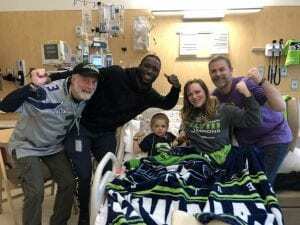 NFL players in Dallas, Oakland, and Seattle brought toys, smiles, and fun to kids in treatment. 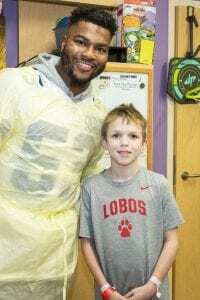 Laughter echoed down the halls as players lifted the spirits of miracle kids and brought the holidays to the hospital. 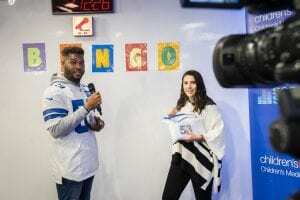 Dallas Cowboys linebacker Justin March-Lillard played Bingo from Seacrest Studios with patients and visited individual kids who were unable to leave their room. 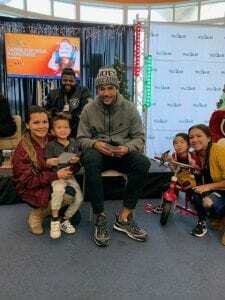 Santa wasn’t the only visitor lighting up the floors of USCF Benioff Children’s as Oakland Raider’s defensive tackle Johnathan Hankins and wide receiver Marcell Ateman stopped by. 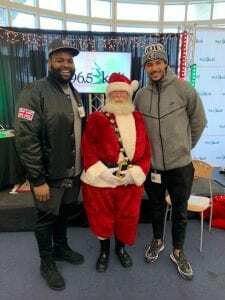 After an hour of having a blast in the patient playroom, Johnathan and Marcell did a radio-thon interview and entertained patients alongside Santa. 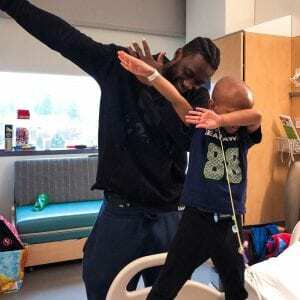 Seahawks wide receiver Jaron Brown went room to room visiting patients, giving high-fives, and motivating the kids. 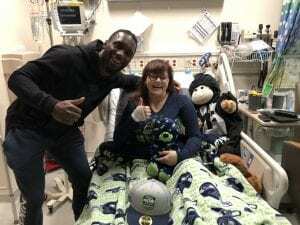 Jaron visited miracle kid Hunter who found #18 on the team poster and decided Jaron was her new favorite player. There is an art to celebrating a touchdown and miracle kid Pranav had lots of moves to show Jaron. The dab was just one of many moves Pranav shared with Jaron to use in upcoming games. Happy Holidays from Children’s Miracle Network Hospitals. Thank you to Justin, Marcell, Johnathan, and Jaron and other generous supporters who bring hope and happiness to kids all over the country. To support the 10 million kids treated in CMN Hospitals every year, visit cmnhospitals.org to donate and support.